369 West Vine Street, Lexington, Kentucky 40507, telephone 859-231-9000. Please use the codeCobb Bar Associationwhen making your reservations. 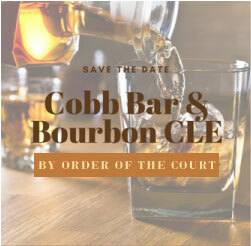 Total cost is $220 and includes bus on Friday and Saturday, Bourbon Tour and 3 CLE credits.Contact and pay Tricia at the Cobb County Bar Association (tricia@cobbcountybar.org). If you are interested in receiving more information, please contactRachele@cherrylawoffice.comto be included in the group email/text. Judicial Host Committee: Judge Mary E. Staley Clark, Judge Robert D. Leonard, II, Judge Kimberly A. Childs,Judge G. Grant Brantley, and Judge Jane Manning. Cobb County Bar Association co-chairs: Justin Wyatt and Diane Cherry.